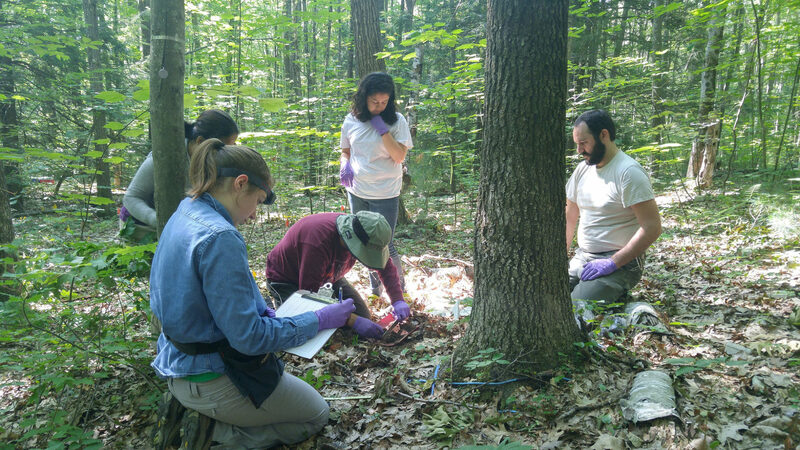 Biologists and students collect soil samples from the Harvard Forest in Petersham, Massachusetts. 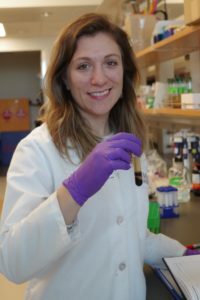 Researchers Frederik Schulz (US Department of Energy’s Joint Genome Institute) and Lauren Alteio (University of Massachusetts) have discovered sixteen new giant viruses in soil samples from a long-term research site at the Harvard Forest LTER, described in a Nature Communications paper published in November 2018. Giant viruses are larger than most single celled organisms, and tend to infect microbes like protists and algae. This study marks the first time that giant virus genomes have been isolated in soil from a forest ecosystem. Most of the current knowledge on giant viruses comes from sampling aquatic environments or growing them in the laboratory. Schulz and Alteio’s discovery expands knowledge of giant virus diversity, and indicates that it is possible to sequence giant virus genomes directly from environmental samples. The following is a Q&A session between Harvard Forest Outreach and Education Director Clarisse Hart and the study’s co-author Lauren Alteio, a graduate student researcher and LTER grad student site representative at the Harvard Forest LTER. CH: Can you tell me about the process of discovering the viruses? When and how did you know what you were looking at? LA: This study marks the first discovery of giant viruses from a terrestrial environment. They were discovered using a sequencing approach (called mini-metagenomics) that involves sorting individual cells from the soil. This type of approach has only been applied in aquatic environments before our study. The giant viruses were found using sequence data by comparing some of their genes (called nuclear cytoplasmic viral orthologous genes, or NCVOGs) to previously known genes from other giant viruses. Giant viruses are often associated with protists, but we were able to capture and sequence many new giant viruses which might have otherwise been overlooked. The sorting method that we used likely caused protist cells to burst, or for small vacuoles containing giant viruses to be sorted and sequenced. The use of sorting could be of great utility for uncovering an expanded diversity of giant viruses and other microorganisms! Harvard Forest LTER doctoral researcher Lauren Alteio, from the University of Massachusetts, isolating genetic material from soil samples in the lab. CH: It’s amazing to me that in a thimbleful of soil, there could be 16 organisms that are new to science. Is soil a kind of “new frontier” for discovering or understanding species/communities? LA: Soil is immensely diverse and we are only beginning to scratch the surface of the organisms and viruses that inhabit it. There are many challenges in studying microbes in soil, including its complex physical structure and difficulties in culturing microorganisms in the lab. In the sequencing era we have the opportunity to unearth some of the microbial diversity we can’t isolate and work with in the lab. Until recently we didn’t have the tools to access the scope of microbial diversity. Using approaches like cell sorting might open new doors for discovery of viral giants and other microorganisms. CH: Anything else I should know? LA: This project is part of another study I am working on (and hoping to publish soon!) using mini-metagenomics to understand microbial diversity in soil. I was able to spend one year at the Joint Genome Institute on a Science Graduate Student Research (SCGSR) Fellowship, where I worked closely with Tanja Woyke to develop the methods used here and analyze these data. This was a great opportunity to work with scientists at a national lab, apply cutting-edge technologies, and learn bioinformatic approaches. Read the press release by the University of Massachusetts.